Woodland is what many would consider a typical public high school. Algebra, biology, and US history are just some of the typical things you would expect to learn, but hidden in the back of the school on the second floor, lies Bill Carangelo’s room. Dubbed as the “Shop” by his students, Carangelo teaches a variety of trade oriented classes ranging from Digital Electronics to Manufacturing, classes that are run like an actual company. Hawk Fabrication and Design, the name chosen by the students for the company when the class, was created just a few years ago. 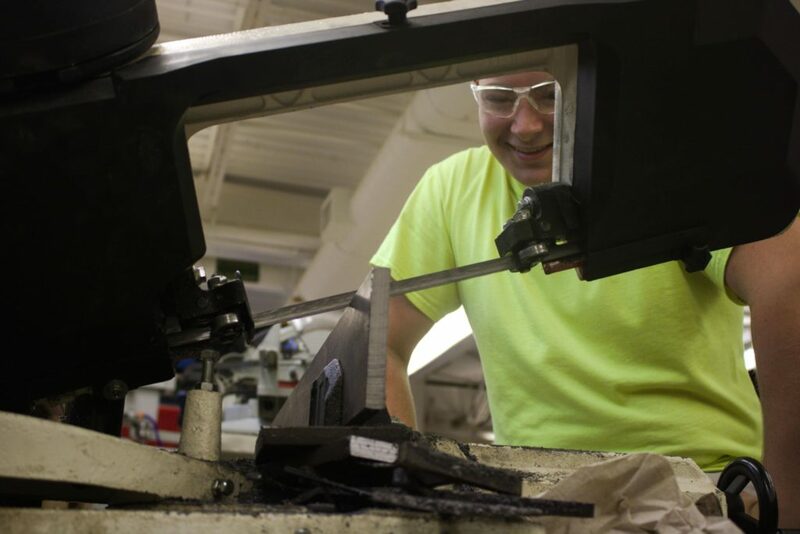 Led by the class foremen, Derek Jonikas and Matt Hankey, the class focuses on teaching a spectrum of skills including: designing, modeling, welding, 3D printing, and using their CNC Plasma cutter, mill, and lathe. Throughout the year the students’ main focus has been their bi-annual electrathon race, an event that takes place in November and May. The students’ goal for this electratron is to build the most energy efficient electric car to complete as many lap as possible in one charge. Once the car is built and the students’ are satisfied they get the opportunity to go to the Lime Rock race track and watch their creation perform. Not only are these cars are energy efficient but also they can reach speeds up to 60 mph, noted Carangelo, who is proud that his students are able to accomplish such a feat with one small electric engine. When the students are not working on their electrathon car, they participate in a manufacturing challenge. This year’s competition involves making a hand-powered water pump and filter. The students are challenged to use a variety of materials to transport water five feet over and four feet up away from its source and in that distance filter the water as well. The challenge is just another way for the students to demonstrate their skills in design and manufacturing. The class is also willing to take on projects for teachers and peers. Carangelo claims that they have the capability to create an original design, and repair furniture as well. Zac Bertrand, second year manufacturing student, has a lot of experience in Carangelo’s class and believes that the class is for students that plan on pursuing a trade in the future and that all of the projects they take on give them a head start with the process and skills of manufacturing. For those interested in the class, the only prerequisite is a recommendation from Carangelo after taking one of the construction, CAD or architectural design classes, and demonstrating leadership.